About two years ago, I was on holiday in Japan. Obviously, I prepared a big list of go-to coffee spots in the cities I visited: Osaka, Kyoto, Nara and Tokyo. One of these spots in Tokyo was Bear Pond Espresso, which I remembered from A Film About Coffee. In it, Katsu shared his vision with the audience and one got a good impression of his dedication to his product. This very much resembled the Shokunin mindset I have been so inspired by. His signature drink, for which people travel all across the city, just to drink it in a couple of seconds and be gone again, has become truly iconic of his shop. The Angel Stain. Of course, I also wanted to try this insane drink that has been raved about for years. 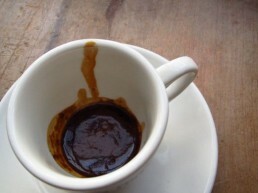 It is an extremely concentrated espresso that consists of only a few droplets of liquid. This makes it very intense and thick, and with the recipe that Katsu uses, it actually tastes like and has the mouthfeel of molten dark chocolate. It has a lot of intense cherry and chocolate sweetness, just a fraction of acidity, some cacao bitters in the aftertaste and actually also some saltiness. For a regular espresso, this seems quite imbalanced, especially considering the intensity with which these flavours hit you, but in this case it all worked out. Since the drink only consists of about three tiny sips, I didn’t have a lot of time to really assess what was going on. My first sip, I used to get to know the “beverage”. The second, I used to assess the brewing and roasting parameters. The last sip was just pure enjoyment. Surprisingly, I actually recognized a lot of techniques used to brew the coffee in this way. This excited me to try and brew my own Angel Stain back in the Netherlands. So from then on, I started thinking about the coffees I still had in storage and which I could use to brew this. In the end, I managed to make a fairly accurate representation of this iconic drink, using the following guidelines. 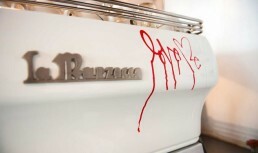 We only need the first 5 or 6 drops of the espresso to keep the thick texture, so we need a naked portafilter. These 5 or 6 drops need to give us the proper balance between sour, salt, sweet and bitter. The first two are quite easy, but in order to also get some sweetness in there, we need to use a really fine grind. The bitters, we’ll take care of with the roast. Since 5 or 6 drops are nearly impossible to consume, we need to brew this 3 times in a row in the same cup. The cup should be as small as possible to prevent the ceramic from retaining too much liquid. Brew pressure can simply be set to 9 bars; pressure profiling would probably smooth out the drink too much, making it lack its iconic intensity. Brew temperature should be slightly lower than usual, just to make sure the acidity is well represented. The roast needs to focus on the dark chocolate flavour notes, so we need to go to a medium-high end temperature, but below second crack, to get the body of the coffee right. We want to extract sweetness and some bitters in just 5 or 6 drops, so we need to adjust the development time for the proper solubility. We don’t want the acidity to jump out too much, but just to add a little extra dimension, so we can use a medium length roast. Since we’re going to do a medium-dark roast, we need a coffee that has the body to complement this; Guatemala, Costa Rica, Cameroon or El Salvador origins could work. The coffee needs to have enough body to withstand the darker roast, and it needs to have a simply acidity buildup to make it recognizable but not complex. This will also allow more saltiness to come through. Catuai is a great example.